Wes Anderson went to prep school in my hometown, Houston, and sometimes it seems that, at least in artistic terms, he never left. Indeed, Anderson all but admitted as much in Rushmore, his breakout film - which was partly shot at St. John's, the River Oaks prep school he attended, and which climaxed with "Heaven and Hell," (below) a stage production by Anderson's avatar in the film, "Max Fischer" (played by Jason Schwartzman). In "Heaven and Hell," this budding director attempted to conjure the Vietnam War on the stage of a high school auditorium, with Anderson positing actual flamethrowers erupting amid papier-mâché palms as young Max mashed up Kubrick (Full Metal Jacket), Coppola (Apocalypse Now) and Stone (Platoon) along with all the other pop sources familiar to a smart prep schooler utterly innocent of anything like actual battle. The sequence was highly amusing, but what was truly striking about it was how clearly "Heaven and Hell" operated the way Psycho did for Hitchcock, or 81/2 did for Fellini - it was an act of self-criticism more trenchant than anything yet written about its creator. Indeed, everything about Anderson's later oeuvre was apparent in Max's production in embryo: the sweet, if arch, artificiality, the adolescent masculine bravado, the nutty conflation of classroom references ("Semper fi, buddy. ""Yeah, sic gloria transit. "), the "diversified" white-upper-class milieu - all of it marinated in an obnoxiously privileged political cluelessness, and all of it watched by a dysfunctional cadre of wealthy, sympathetic adults. But what's particularly striking about "Heaven and Hell" is that Anderson posted it not as a talisman of hard-earned self-knowledge, but rather as a kind of manifesto. This is what I loved to do when I was 17, he essentially declared at the climax of Rushmore, and this is what I'm going to keep on doing, only on a larger and larger scale. And so he has - even with budgets in the millions, his movies cling tenaciously to the stagey artifice of "Heaven and Hell." Luckily for Anderson, his brand of sweet, immature self-consciousness touched a deep chord in the millennial audience. The self-aware distance, the cultural well deeper than any contact with actual life, the ability to construct a private simulacrum of reality - these would prove perhaps the keystones of millennial experience, and Anderson only rarely strayed from them; even as he has edged toward middle age, he has remained a determined faux-naïf. Indeed, again and again - in The Royal Tenenbaums, The Life Aquatic with Steve Zissou, and especially Fantastic Mr. Fox - Anderson has returned to more or less the same formula, conjuring yet another variation on the boarding school, with unhappy, inscrutable grown-ups and their damaged children wandering through an idealistic (sometimes even paradisal) environment that is beset by an absurd - but pervasive - militarism. The main characters - i.e., the kids - have yet to begin to deal with, or even process, their own flawed natures; and their parents, though accurately, even acidly, rendered, are likewise internally blank, and accepted without judgment. Indeed, if anything, they're pitied by the young, who are still pure of heart (and whose innocence often serves as balm to the adults' broken souls). And thus the battle that would normally ensue between adolescents and parents in most similar scenarios can never actually get off the ground in Anderson, because the combatants have been separated into different, uncomprehending camps, and actual emotional intimacy (even with one's self) is all but impossible. The kids can't quite penetrate their parents, as they're hidden behind a benignly regimented screen; and while bad things sometimes happen to Anderson's young heroes, they are generally spared the pain of authentic self-discovery, as the director is always careful to hold his young charges back from the shadows in their own souls. 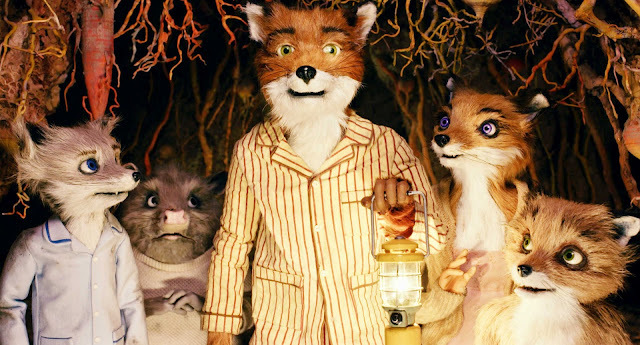 Fantastic Mr. Fox - for once, the dollhouse was populated by actual dolls. These precepts, rigid as they may be, have reliably yielded quirky comedies of manners in which everyone seems to be dreaming with their eyes open - hence the familiar surrealism of Andersen's imagery, in which settings float between the real and the fake (like the jungles of "Heaven and Hell," they're imaginary gardens with real flamethrowers in them), and where the cinematography swings between the self-consciously symmetric (above) and the self-consciously skewed. Some critics have begun to bristle at Anderson's prep school puppet shows, it's true - but I'm increasingly struck by a deep cultural problem that his work quietly, but persistently, states, which might be summed up as - "If my audience is in a state of permanently arrested development, shouldn't my movies be, too?" In other words, are Anderson's twee dollhouse dramas actually the genuine article, given who's watching? Are they the best this generation can do? Or to ponder these questions even more deeply - is the culture in which we live now operating as a kind of giant, virtual boarding school? Have we been separated from our own upbringings (in our dual-career households), and doomed to basically play with ourselves rootlessly, growing ever older while never quite attaining adulthood? This is a very weird and troubling question, frankly, and one that I think will always cling to Anderson's work - but as it is a question for his audience as much as this artist, I doubt it will ever be articulated by the mainstream critics. And at any rate, under some circumstances the troubling dimensions of Anderson's art can all but be elided. Fantastic Mr. Fox was one such instance, because its dollhouse universe was peopled by actual dolls (above). And now we have the charming Moonrise Kingdom, which may be the most delicately rendered (and highly detailed) of all Anderson's works. Poised somewhere between The Catcher in the Rye and The Little Prince, it casts a bemusing and lingering spell - I don't think it's too much to call it truly haunting; like Mr. Fox, it could well prove a minor classic. But we'll ponder its virtues (and occasional flaws) more fully in the second half of this critique. To be continued.